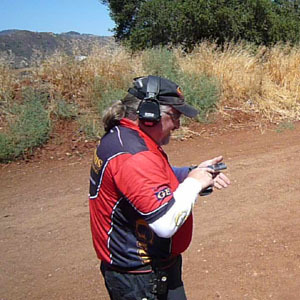 USPSA has different Divisions with different types of equipment. Whether you want to bring a 1911 single stack pistol, an over the counter "production" style gun (glock, HK, Sig, etc), or a revolver, USPSA has a place for your choice of gun. Limited is the most popular division. Most Limited competitors shoot wide-body 1911's (STI, SV, Para-Ordnance, Caspian), a Glock, or one of various CZ/TZ 75 variants in .40S&W caliber. Allowable modifications include (sights, grips, slide stops, magazine releases, mainspring housings, mag-wells, etc.). High-capacity magazines are used extensively (magazine length limited to 140mm, and 170mm for single-stack guns). Production handguns with double/safe-action triggers are used by many competitors using a double-action auto in 9mm or .40 S&W caliber. Glocks are popular, as are Berettas, CZ's, SIG's, Springfield's, Para-Ordnance LDA's, and others. Competitors may change the sights (of notch and post type), add skate board tape to the grip, and tune the internal parts of the gun, but most externally-visible changes are not legal. Magazines are limited to 10 rounds, holsters/mag pouches must be "non-race-type" and worn behind the hip. Single-action autoloaders in .40S&W and .45ACP rule the roost here. Equipment rules are identical to Limited Division, but magazine capacity is constrained at 10 rounds. Open is the top-fuel drag racing division within USPSA. Competitors can make just about any modification imaginable. High capacity magazines (max 170mm length), optical sights, and recoil compensators are practically required. The most popular cartridge is .38 Super. Intended for stock revolvers, Revolver Division is dominated by the Smith & Wesson 625. Competitors may only fire six rounds between reloads, and modifications are limited. Optical sights, porting, and recoil compensators are NOT permitted. Competitors may change grips, enlarge the cylinder release, change sights, chamfer cylinders, and tune the action (trigger job). Catering to the desires of traditional 1911 fans, USPSA introduced a provisional "1911 Single Stack" division in 2006. Single-stack Government model pistols (such as those made by Kimber, Springfield Armory, and others) are the only guns allowed. Competitors must use a single-stack 1911 pistol, use standard-capacity magazines (8 rounds for "Major" calibers, 10 rounds for "Minor"). Holsters must be worn behind the hip and must be a practical "non-race-type" such as those intended for daily wear.